If you would like to create a new menu or add new entries to a preexisting menu, access Menu configuration from the Configuration dialog. If you are unhappy with the existing survey menus or you wish to create a special survey menu for a certain user group, edit the default ones or create new menus. You can also add new menu entries or edit the existing ones. 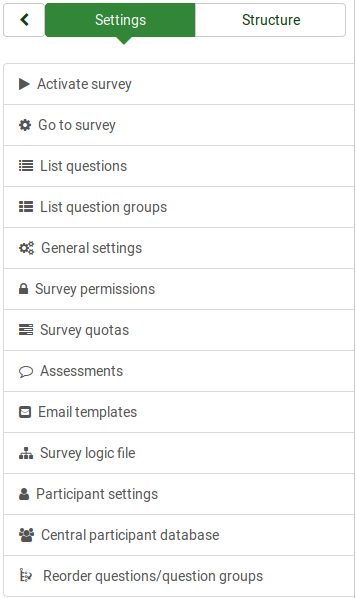 Once accessed, you can see in the Menu Configuration panel a table with all the existing survey menus. Parent: Use this option to select the parent menu of another survey menu. 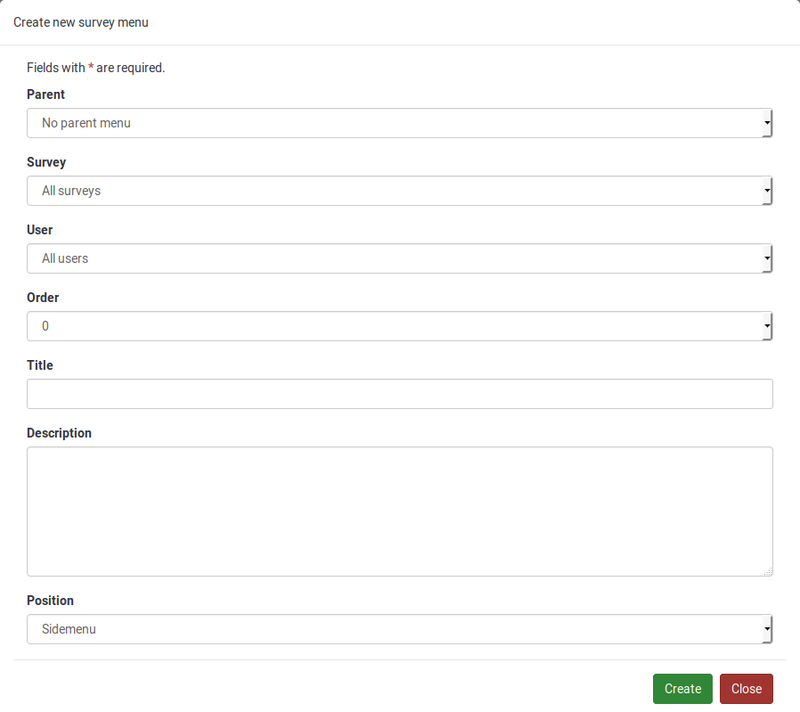 In this way, a survey menu will be displayed within another menu once clicked. For example, the plugin menu is a survey menu that has as parent menu the mainmenu, being displayed the bottom of it due to its order. Ordering: If you use more menus that have the same position, ordering them would help you better organize them. Bottom bar : The menu is going to be on a bar located in the lower part of the window. If you want to delete a menu, click on the red trash button that corresponds to that respective menu (located in the Action column). If you click Delete now, all the menu entries of that menu will also be deleted. In the case in which you edited the default menus and you want to return back to the default values, click on the Reset button located in the upper right part of the window. Once clicked, you will be asked to confirm the operation. Please note that all the custom menus will be lost if you decide to proceed. Attention : Please note that in order to backup your survey menus configuration, create a LimeSurvey database backup. A separate option will be introduced in the near future to facilitate only the backup of the survey menus. Check the following examples to better understand how you can edit survey menus. To change it, access the menu configuration panel. Edit the mainmenu and change its position from sidemenu to collapsed menu, and the position of the quickmenumenu from collapsed to sidemenu. We wish to have it displayed in front of the Plugin menu, so we select "Survey menu" to be the parent menu,order "2", to be displayed before the plugin menu, and position "sidemenu" (similar to the position of the parent menu). To do that, you need to configure the LimeSurvey menu entries. To do that, please continue reading the following wiki section.